Obituary for Colleen Christina Kunz | Prairie Sunset Funeral Home, Ltd.
Colleen Christina Kunz, of Lac La Biche, Alberta passed away March 15, 2018 in Westlock, Alberta at the age of 79 years. Colleen will be loved always and missed forever by her husband, Don; children: Shelly (Brian), Randy (Jackie); grandchildren: Caroline (Kevin), Tyler (Taisya), Jeremy, Dawn (Dave), Craig (Cathy); great grandchildren: Kaiden, Savannah, Finnigan and Alexander. Although Colleen had well over 100 nieces and nephews, she had a special closeness to her twin sister’s sons, who she often felt were more like her own children: Marty, Clayton, Todd, Darren and Doran. She is also survived by cousin, Terry (Syd); In-laws: Lottie, Hildegarde (Leonard), Alvina (Jack), Delores, Karen; along with many other relatives and friends. She was predeceased by her parents Clayton & Pearl Brenton, her father & mother in-laws, Anton & Anastasia Kunz, brother Frank Brenton, twin-sister Darleen (Brenton) Woolford, sister–in-laws, Leona (Kirkpatrick), Duly (Boist), Bernadette (Kunz), brothers-in-law Hank Woolford, Al Millar, Clarence Kunz, Charlie Hoffart, Edward Kunz, Charlie Boist, Herbert Kunz, Tony Kunz. Colleen, and her twin sister Darleen, were born December 23, 1938 at Cardston, AB to Clayton & Pearl Brenton. She was raised on a farm near Del Bonita, AB often finding it humorous to say she grew up in an area referred to as Whiskey Gap. She attended school at Del Bonita, AB completing her education by attending Secretarial College at Lethbridge, AB. Her love of music also began as a young child with both her and her twin sister attending piano lessons at Cardston, AB. She had warm memories of her parents taking her to these lessons, having to pay a quarter for each lesson. Both she and her sister became very accomplished piano players, both playing in bands and for various charity organizations. In 1956 she met Don while on a blind date with her twin sister. After a 2 year courtship, they married October 4, 1958 at Lethbridge, AB. At the time she didn’t realize that October 4 would become the time of year that Don and Randy would go away for their annual week-long Moose hunting trip. Thus, she celebrated many of their wedding anniversaries with a phone call from the bush and being serenaded with a “Fred Flintstone” rendition of Happy Anniversary. This also became the time when her and Shelly would plan and enjoy their solo time together, without the family guys. Colleen and Shelly would plot their escape to travel to Cardston, AB to visit with her twin sister. These visits always meant late nights of reminiscing stories of old and rehashing stories of present. And of course, these visits always included a leisurely drive past their childhood farmland, unintentionally travelling far enough, ending up across the border where they would be forced to shop. Shelly recalls hearing many of the same stories but also fondly watching her Mom & Aunt behave and chat like young teenage girls, into the wee hours. Don and Colleen’s first home was in Fort Macleod, AB moving to Medicine Hat, AB by 1960. Their first child, Shelly was born in 1961, followed by their son, Randall in 1962. They lived in Medicine Hat, AB until 1972 when they moved to Lac La Biche, AB where they call home until this day. Colleen enjoyed the outdoors life that Lac La Biche, AB offered spending much time camping, berry picking, gardening, and fishing. Colleen was well known for her cooking skills, being teased that all she had to do was stick her finger into a pot of water and it would turn into a gourmet meal. Her gardening skills produced abundance of ingredients for her much-loved Grandma Kunz pickles, that were a favourite of her grandchildren. Grandma also had the much sought after “back scratching hands”. All of her grandchildren sigh with recollection of being put into a trance as she tenderly scratched their backs with those amazing fingers. Often after the back-scratching session her grandchildren always knew Grandma’s freezer had ice cream available. We can still see her loving grin as she would watch her grandchildren contently fill their not-so-small-bowl with ice cream. This same scene followed through with her great-grandchildren. Colleen and Don’s love of music was often enjoyed by family and friends when they became part of a small group of musicians, playing at local dances. Their musical talents were also enjoyed by the family during family gatherings. The singing would follow as we moved into playing cards, singing “Blue Christmas” during the right moment of Uno (a long ago, hilarious family memory). We can recall with great fondness the many Christmas gatherings around Mom at the piano and Dad nearby with his guitar. We would sing and harmonize for hours. One such song was “You Are My Sunshine”. During the last few months, Mom often sang this tune continuously, using the tune to sing out responses to the nurses. The nurses were amused when they tried to convince her medicine tasted good mixed into pudding, and she would grin and sing her response using the You Are My Sunshine melody, “This doesn’t taste good, it doesn’t taste good”. This song became Mom’s tune for everything. We tried to persuade a change at Christmas by singing out Jingle Bells. However, she didn’t miss a beat following the second line of Jingle Bells, with a smile on her face and chiming in with “You Are My Sunshine, my only sunshine”. Colleen also devoted much of her spare time to various charitable organizations. She was always willing to lend a helping hand volunteering where needed and was called upon by many organizations to assist with their yearend accounting tasks. Also close to her heart were her pets. Don and Colleen were never without a pet; each and every one was treated like royalty. Most of their pets were acquired by rescuing when they appeared on their doorstep. Some they kidnapped by convincing the animal they didn’t need to return home with their owners. Randy and Shelly both had occasions where they were persuaded to surrender their pets. We often teased any of us would love to be reincarnated as one of their pets. This fondness could also be witnessed during the morning making-the-bed ritual. All of us received military training from Mom on making our bed in the morning. Her routine included the strategic placement of her stuffed toys (dog and cat) as well as a special spot for the family pet. Dad was a quick study and continues with the routine to this day. If Mom called any of us early in the morning, we feared she would detect from our voice if our bed was made. Colleen valued traditions and celebrations. Many family members will remember the “birthday book” that was paraded around at every family gathering with instructions to make sure families confirmed all names were noted on their special days. She was often sending out birthday and anniversary cards or starting out the morning with a phone call, singing Happy Birthday/Anniversary. Yes, family and friends, her “birthday book” will carry on. Mom/Grandma, we would love to get just one more phone call from you, one more back scratch, another jar of pickles, and one more song. You will always be our Sunshine. 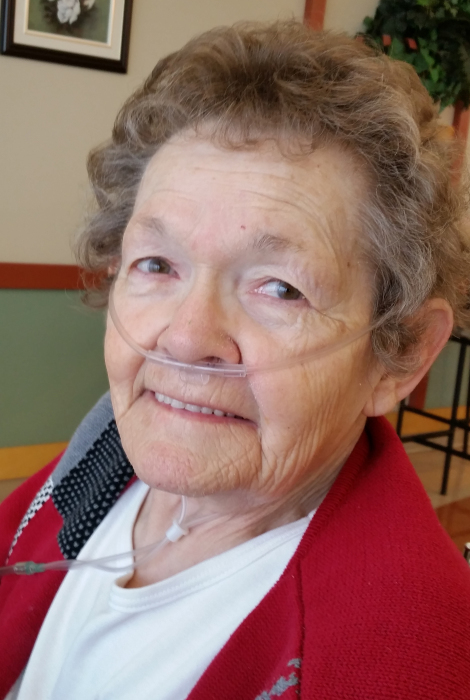 Colleen requested no funeral service be held and her family is respecting her wishes. The family will have a small, private Celebration of her Life at a later date. Anyone who so wishes may make a memorial donation directly to the Alberta Lung Association, Box 4500 Station South, Edmonton, AB T6E 9Z9.